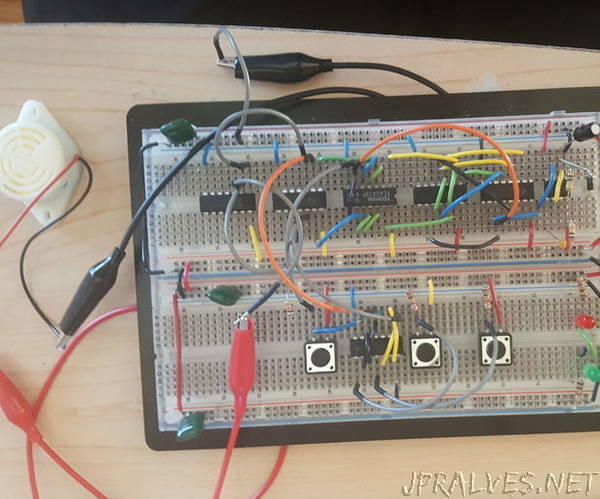 “This project demonstrates the basics of digital logic, the characteristics of a NE555 timer, and demonstrates how binary numbers are counted. The components used are: a NE555 timer, a 12-bit ripple counter, two 2-input NOR gates, a 4-input AND gate, a 2-input AND gate, and a 2-input OR gate. The logic gates, NOR, AND, and OR come in TTL and CMOS equivalents which can be found at Lees Electronic. This project is a simple egg timer with two settings: hard or soft boiled and comes with a reset function.